Blog How to Soundproof Barn Doors the Right Way! How to Soundproof Barn Doors the Right Way! The first thing that comes to mind for most people when they see sliding barn doors inside a house is how much noise gets through to the other room? I questioned that also when I visited a friend that had installed some as their bathroom door. I learned a few things while talking to my friend and that’s what I’ll be talking about in this article. How to soundproof barn doors? There are a few ways to soundproof a sliding barn door, but the most effective way is to make sure there are no gaps or crack to allow noise to travel through. Make sure your barn doors are made from solid wood, meaning a solid core and not a hollow core. A lot of regular door soundproofing methods are the same with a barn door; you just need to do things a bit differently to make sure everything works as intended. I won’t be talking about things that you can place in front of the door because I’ve discussed that in details in another article – How to Soundproof a Sliding Glass Door. This article will focus on how you can add or change the structure of the barn door to make it a bit more soundproof. How to Close the Gap on Barn Doors? Here is a list of the top 8 ways to soundproof a sliding barn door. Some of you might already have one installed in your home and I’m sure a great many of you did it as a DIY project. You don’t need to stress yourself out or dismantle the barn doors. If there is noise coming through to the adjacent room there are many ways to remedy this problem. If you have a small gap between the wall and the barn doors you will need to seal it if you ever hope of reducing the noise. When the door is closed, you will want it as close to the wall as possible. This will be a challenge if you need to glide the door over the baseboards. By gliding the door over the trim you will have a gap the width of the trim. There is an easy fix to close this gap without having to cut a piece of the baseboard. Apply a weather-strip the same color as the barn door from top to bottom on the side where the air gap lies (If it’s only on one side). Applying a self-adhesive weatherstrip to bridge the gap between the barn door and the wall can work very well in reducing some of the noise coming into the next room. Repeat this step on the bottom of the door. Chose a weather-strip that glides well on the floor and closes the gap firmly at the same time. 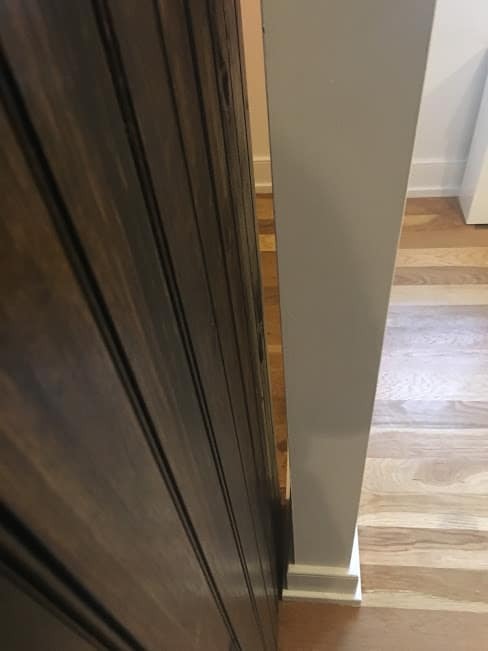 Here is a picture below from the houzz.com that shows how someone installed a weatherstrip on the gap side of their barn door to close the gap. If you have a gap in the bottom of the barn door you can screw a board to the bottom of the door. You will have to remove the door for this process to be more accessible. You can either glue or nail a flat molding on the bottom of the door. Have a 1/4″ overlap on the door to cover the gap where the noise is coming through. Like most doors, adding a door sweep is an inexpensive yet effective way to block some of the sound coming through from the other room. I would probably use a brush style door sweep. I think it would work great on a sliding door because it would not stick on the floor yet still make contact with the floor to make sure its tightly sealing the gap. First off, If you haven’t begun your barn door DIY project then make sure you get an oversized door. Sometimes people will go the cheaper route and chose to install a regular door on a slider and call it a sliding barn door. This method will leave a major gap where light and sound would be able to get through. 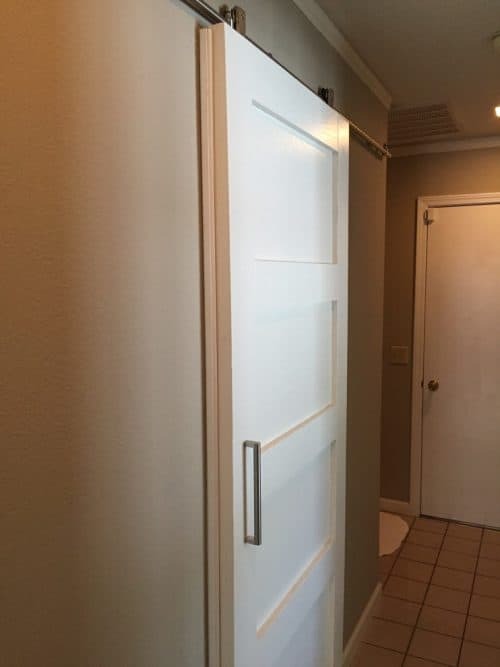 If you are on a limited budget and you can only afford a regular door, you can make some modifications to make the door bigger. You can add a piece of wood on the inside of the sliding door and paint the door the same color. You might have to scribe the bottom piece to get closer to the baseboard. Like anything, using quality hardware will have a big impact on the performance of your barn door. You should spend a bit more money and use high quality and sturdy hardware so everything is tight and doesn’t rattle and move. An inexpensive rail, for example, might not hold the door properly in place leaving a tiny crack between the top of the door and the wall. You might not be able to see the crack behind the edge of the door, but you will certainly be hearing more noise coming into the room. Most of the people that I talk to that have a barn door have managed to install it themselves. There is nothing wrong with doing a DIY project but a carpenter that has built and installed many barn doors will probably know how to do a better job. If you don’t have much experience building a barn door, there might be gaps left after installation. For example, the measurement might be a bit off leaving a gap on either side or the top. Of course, it will cost a bit more to hire someone, but at least you know that it will be done right if the specific carpenter has experience building barn doors. 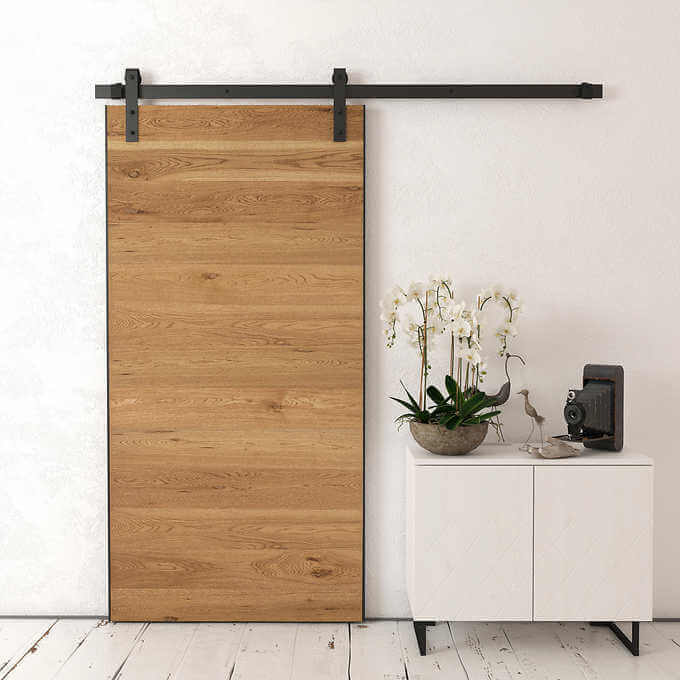 If you have a sliding barn door that looks like the one in the picture below, then you will probably need a bit more than a small weather-strip to stop the noise. You can buy what’s called a soundproof foam corner block (Amazon Link). You can attach this acoustical foam block on the entire length of the door. What’s nice with this is that it will not cause any damage to the wall when the foam is gliding when opening and closing the doors. 1 Inch gap on both sides of sliding barn door. If you have some extra cash to spend on this project there are some wonderful sliding barn door style made of solid wood (solid core door). A solid core barn door will give you better sound deadening than a normal hollow core interior door. Any door made of solid wood or even foam core doors will perform much better versus glass or hollow core doors as far as sound deadening is concerned. The denser the door, the better. As much as I like sliding barn door, I don’t think I would ever have any in my home. There is absolutely no way I could hope to soundproof the door with three young boys living under my roof. They would surely knock it off the rails and have it destroyed sooner or later. Please let us know if you were successful in reducing noise coming through your barn door and if there’s anything we forgot to mention. Thank you and please share with your friends who have a set of sliding barn doors in their home.